Networking is not just a skill – it is an urgent requirement for both individuals and companies. The rise of social media then, is not surprising since the very basis of these sites is networking. Smart business networking allows companies to attract more customers and receive great testimonials from existing customers, thereby increasing profitability and market reputation. The only reason that we see a surge of new companies and the success of many of them, it is due to their business networking skills. In fact, even large and well established companies cannot hope to survive without consistently applying the art of business networking – there is too much competition to let your guard down! It would be useful to understand some of the reasons why business networking has become even more crucial than before and is not going to be less important any time soon. 1. In my experience, business networking is most crucial to remain an influential part of the market and company groups and industries. People are able to generate leads for themselves and even their associates using the art of networking. There is a huge potential of gaining more business and leveraging your business’ strengths by these interactive activities. 2.	Business networking is a form of communication. When businesses ‘communicate’ with each in this manner, there is a world of opportunities that opens up and this is how new ventures, joint endeavours, fruitful partnerships, gaining of assets and whole other set of lucrative deals come about. While it is true, that no one can be successful by operating alone or remaining in a silo, it is also equally correct to say that it is not prudent to grab every opportunity that comes about. Business networking brings on market intelligence too and makes people choose wisely and profitably. 3. No one who is anyone today became so by working alone. It is the power of business networking that has made so many people and businesses more successful than they would have hoped or expected. Networking with relevant people and opportunities can make even individual entrepreneurs and business owners relevant and capable of leaving their mark. Business networking paves the way to getting ‘influential’ people in one’s network which in turn opens up more possibilities and opportunities, as these influencers attract others towards them. Be smart and sharpen your communication skills to succeed in the arena of business networking. 4. No one person can have all the good ideas. 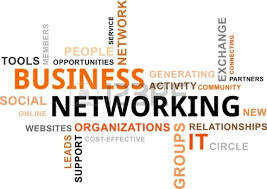 Business networking opens up the realm of communication and ideas exchange as like-minded people talk and speak of things that are of common interest. It is a huge learning opportunity and must be leveraged to gain optimum advantage for oneself and the company. As you garner advice and help from industry experts, it is not long before you are seen as a subject matter expert and soon people are attracted to you for advice. 5.	Business Networking raises both an individual’s and a company profile and influence. As more people become part of your network, you get noticed, are spoken about and also get invited to high profile events and functions. These events in turn raise the number of leads you can get and also attracts more people to be part of your network. Great business networking then, works almost like a huge magnet! 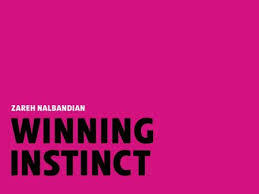 On the personal front, I know business networking has boosted my confidence and made me a better listener and learner. I can now engage in smarter conversations, beyond business, and have been able to make some strong and lasting business connections even with people who are completely unlike me. It may seem daunting at first, but through consistency the new connections you build and the proficient relationships you foster will only serve to strengthen your business and you as a person. It would not be incorrect on my part to say that business etiquette, though seemingly a clichéd topic is often also the most ignored. Displaying restraint and exhibiting manners in a corporate / business environment are extremely crucial to a congenial and professional work setup. The world is shrinking given the surge in globalization and digitization. Boundaries are transcended and people from varying cultures, demographics and beliefs are getting in touch at the click of a button and therefore understanding how to work with this diversity is becoming more important in order to maintain business etiquette. Maintaining business etiquette allows people from any background and culture to work collaboratively and communicate respectfully to their fellow-workers. Paying attention to good manners in a professional setting creates an atmosphere of trust, integrity, helpfulness and all those other niceties that make working together a lot of fun. Business etiquette is about looking beyond our limitations and those with whom we work and instead focus on creating stimulating synergies irrespective of many obvious differences. 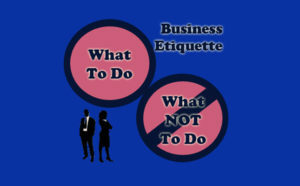 Business etiquette, in my opinion, has a rather vast scope. Under its realm fall a number of factors which I believe are often overlooked, limiting people’s view of the subject. Displaying good manners is as simple as dressing appropriately to the more complex subject of communication. To show respect and consideration for the views of co-workers is also business etiquette. Spoken and written communication, body language and other expressions form a vital part of corporate manners. Taking the trouble to understand how people of different cultures prefer to dress or eat, refraining from speaking on topics that could be sensitive issues, respecting the time and space of those around you and many other such factors fall under the umbrella of business etiquette. Times are changing and so are a number of personal and professional preferences, but basic business etiquette have not changed to match these. They seem to run across businesses, industries and demographics – but it is best to observe what the acceptable norms are before-hand in order to avoid embarrassment to yourself and inconvenience to others. – The most basic is probably a firm (not death grip) handshake. It is a simple yet polite and confident gesture and lets the person before you understand that you are open and approachable and would like to maintain a healthy professional relationship. – We have been taught since our childhood to say please and thank you. This has not and in my view, will not change irrespective of how much more progress the humankind makes. These are basic courtesies that should be non-negotiable. – Everyone wants to be heard and each one of us is sometimes over-zealous to express our views. Business etiquette demands that one should never interrupt or speak when someone else is talking. It is just plain rude and shows a very high level of disrespect. – Mind your language – even if your company culture is friendly and relaxed there is no excuse to use derogatory, cuss or outlandish language. – An oft repeated mistake is firing off emails or other written communication without re-checking. The fact is that when you send out communication that is rife with errors, you are showing disrespect to the receiver. It tells them that you did not bother to take time or make the effort to send them quality work. Very poor business manners! – Even if your company has an open door policy, it is exceedingly impolite to assume that you can interrupt a person’s work just because you have something to discuss. Ensure that you ask for permission to walk-in or better still schedule time in advance with the person. – The most common one – engaging in gossip. It is human nature to be curious, but speaking badly of someone behind their back is very disrespectful to the person and it also shows your character in a poor light. – Respect people’s space and the need for privacy. Trying to eavesdrop on a conversation or reading from the screen of another person’s computer, is for me among the top irritants and excruciatingly annoying habits. – It is common courtesy to acknowledge a person who approaches you or even if you see someone at a distance. Being busy can never and must never be a reason to ignore people. – The two topics that people can never seem to agree on are politics and religion. Business etiquette demands that topics that can be potential problems should be avoided at all costs. Keep your views on these topics in the confines of your mind. – Irrespective of your position and work schedules, if you have committed to being somewhere at a certain time, be there on time. Reaching late shows lack of respect and you wouldn’t want it done to you. – You know that you are part of a meeting and the time is blocked off for the purpose – so where is the need to continually take calls or respond to messages and emails. Doing so shows lack of concern and respect for the others present in the room. Unprofessional mannerisms and a lack of business etiquette could not only drive customers away but also let your employees and co-workers respect you a lot less. Grasping the basics of business etiquette will facilitate communication and increase productivity in the workplace.